Can Training Tackle Negative Performance at the Workplace? The lifeline of any organization is its employees. Employees armed with efficient skillsets and the right attitude spell success for your organization. But then the fact remains that all employees aren’t alike. According to a Gallup Survey, almost 70% of the American workforce is not working to its fullest potential. This points to the fact that that there are factors that affect employee performance. 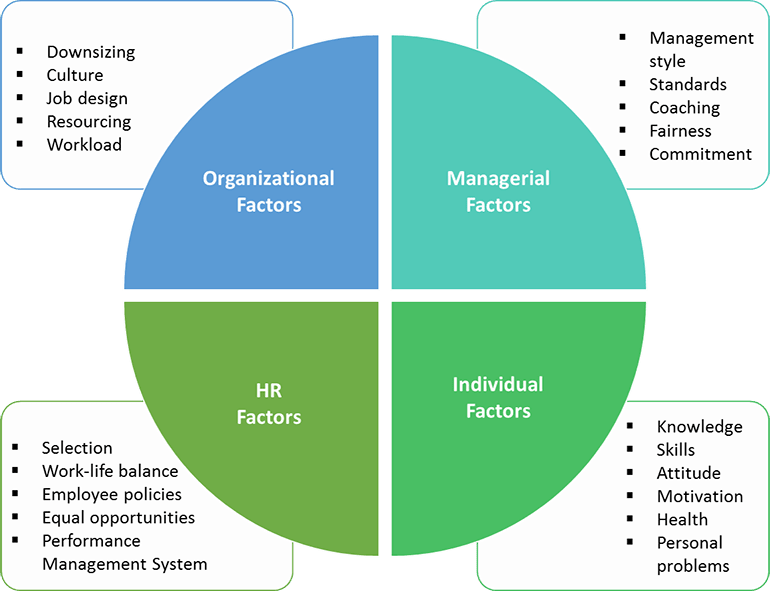 There are many factors that can affect employee performance and these factors can be divided into four categories. Of all these factors the ones that are more difficult to handle are the ones related to individuals or people. Deming was right when he said that “People can face almost any problem except the problem of people….Faced with problems of people, management will go into a state of paralysis”. Negative performance or poor performance arises when the ideal performance expected from employees does not match their actual performance. Can training help tackle this problem of poor performance? To a certain extent, yes but not always. Can training offer a solution to an individual’s negative performance at the workplace? Take a look at the table below. Can Training Offer a Solution? A negative attitude stems from negative emotions such as jealousy, anger, mistrust, greed, etc. This affects not just the individual but other employees too. Partly. Training can, to a certain extent, address behavioral problems which in turn can change attitude. Other solutions are counseling or manager feedback. May or may not have the knowledge and skills but is not motivated enough to work. This is often a result of external factors. No. Coaching or talking to a mentor might help. Poor health No. Training can only create awareness on health and preventive measures but cannot offer a solution. Personal problems No. Employee assistance programs might help. How Does Training Help Address Negative Performance? Here’s how training can address negative performance factors such as lack of knowledge, lack of skills, and problems with attitude. There are three situations where you might need to design training to address lack of knowledge. For the first two situations, you might want to blend classroom as well as online training, whereas for the third, eLearning can offer an excellent solution. According to McKinsey, almost 40% of American employers say that they cannot find people with the required skills, even at entry-level jobs. Be it new hires or experienced professionals who need to upgrade their skill sets, organizations can tackle this problem with strategic training programs – both instructor-led as well as online training. Before you go ahead with your training initiative, perform a skill gap analysis to assess the current and expected skill levels of employees. Try answering this question – Do your employees have the required skills to perform their job well? If the answer is no, then a full-fledged training program is required. On-the-job training is something that cannot be skipped when you want to tackle lack of skills. But if they already have the required skills and have forgotten it, microlearning is a good strategy for reinforcement of learning. One problem that every manager faces is dealing with employees who have the wrong attitude. Even if the employee listens to your feedback, he/she is either going to be defensive or simply clueless about how to change their attitude. So, it would be right to say that training can provide the answer to a few of the factors that cause negative performance. You need to have an understanding of what is a training issue and what is not. Thumb rule to follow: Do not try to solve every performance problem through training. Use training judiciously and make a wise investment. To help you further on making the right decision, make use of our eBook on E-learning to Achieve Business Goals. If you would like to share how you tackled negative performance factors at your workplace, please use the Comments section. We’d love to hear from you.